This artist’s book tells the story of a young woman in Calabria, Italy during the 1950s, whose real life reads like a fairy tale, or a soap opera, in six installments. In order to give lasting form to this oral history, the reader must release the text, silk-screened on linen pages, from six tiny bars of soap, with numbers imprinted with lead type. After hanging to dry, ironing optional, the rags slot into six acid-free pages with oval die-cuts, through which the text remains visible. The pages are bound with a linen rag into a handmade, cloth-covered album, with the title embossed into a raised oval on the front cover. 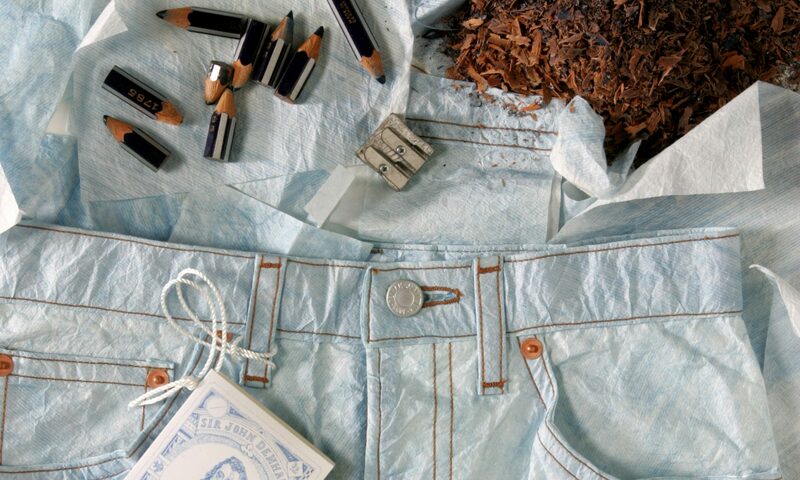 The book is housed in a matching cloth-covered box, lined with rags and sealed with a color-lithographed soap label. The process confronting the reader reflects that which the protagonist must face, ultimately transforming her. You must merely transform the story, allowing the young woman to wash her hands of her sorrows. But for all your trouble, there may be a reward! One lucky person will discover a special coupon hidden in one of the bars of soap. When redeemed, it will be worth a free round trip ticket from the United States to the artist’s studio in Bologna. If no one comes forth, there will be a lottery on January 1st, 2000 to decide which lucky customer will win a free trip to Italy in the Jubilee Year. 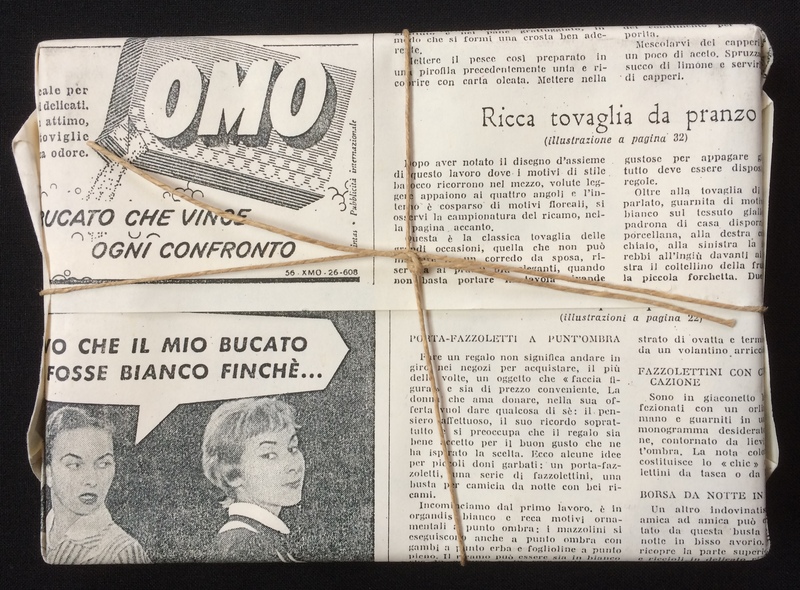 The box is wrapped up in an acid-free reproduction of a page from a woman’s magazine, October 1956, titled “Mani di Fata” or “Hands of the Fairy.” This page, wrapping the six pieces of soap, was an iron-on design for embroidery inserted as a gift in the same issue. The magazine itself was found on the floor of an abandoned villa in Calabria, not far from the town in the story. Wrapping up packets in recycled newspaper and twine is still the way fresh eggs or handmade soap travel from household to household. At the time of this story, the women used stones for washing the linen, silk, and burlap they cultivated and wove for their own use. Typeface for silkscreen and lithograph in Stone Sans and Stone Serif. Cover embossing and lithograph printing by Stamperia Valdonega of Verona. Linen from Gori Tessuti of Prato, soap from Saponificio A. Gori of Arrezzo. I always want to know if there is really a winner for all those contests advertised on the packages of things we buy. Recently, it pleased me to hear that a friend of a friend in Italy won a prize from a box of rice, except that, as an animal rights sympathizer, she will never claim the fur coat prize. With this in mind, I feel compelled to let you know about the results of the lottery, and a few things concerning the work itself. First of all, the lottery was not conceived as a selling point for the book. The lottery was incorporated as an incentive to dissolve the soap, and hence read the story. 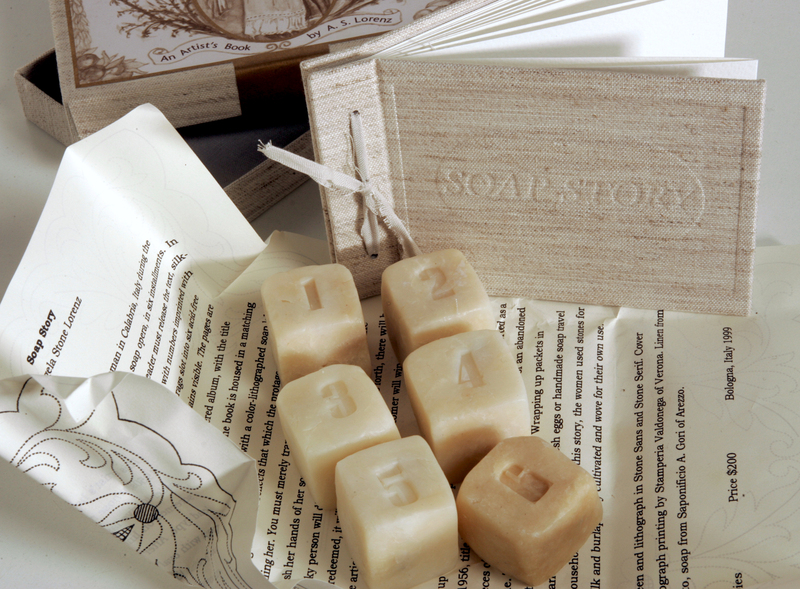 The text is concealed in the soap for conceptual reasons relating to the story. The reader must undertake a process similar to the young protagonist; when the tale ends, the soap has dissolved and so has the woman’s job washing in other people’s homes, for she has washed her hands of her economic woes forever. The lottery is also conceptually related to the work because contests have historically been advertised with soap products, and even more significantly, the once ostracized young woman who gains respect and riches against great odds wins a lottery of her own. This is a true story, told to me in 1989 by the granddaughter of the only named person in the book, Donna Teresa. I was so affected by this remarkable account that I worked for 10 years, off and on, trying to find an appropriate way to embody it and share it with others. This entailed experimenting with many kinds of soaps and formats, cooking, melting and solidifying soap for years at home and in my studio, while I struggled with physical and conceptual aspects of the work. Initially, even the text was to dissolve, but eventually I decided that the story does in fact remain, and so it must be present after the soap disappears. Also, I think it is reassuring to the “reader” that the book is not entirely consumed in the process. My previous experiences with Chewing Tzu – The Rumination Book taught me that people are hesitant to alter a work of art, even if that means not really experiencing it, or even viewing it. Some of this has to do with perceiving Art with a capital “A”, some of it with the idea of conserving value, or an investment. However, Chewing Tzu, an open-ended edition made out of chewing gum with edible text, costs only $15.00, and people tend not to open it even if they receive it as a gift. With that in mind, I knew a give-away price would not encourage people to use the soap in Soap Story, so that they would actually read the cloth pages. Hence the lottery, a bigger incentive. I had thought about incorporating a prize as an incentive – such as a gold ring. But someone could x-ray the book, or put it through a metal-detector before deciding whether it was worth opening their copy. At one point I bought 50 brass wedding rings, which were given in exchange for gold wedding bands during Mussolini’s reign, to hide in the soap. But Soap Story took place in the 1950s, so it didn’t seem appropriate. Instead, I made an embroidered coupon which has yet to be discovered…perhaps there will be another prize yet. It was actually Bob Feldman of Parasol Press who suggested a lottery with a really big prize, like a plane ticket, to inspire people to use the soap. Lottery or no lottery, the price is a bargain, considering the cost and labor of the hand-made books and boxes wrapped and lined with cloth painstakingly sized with glue, the hand-cut silk-screened linen pages, embossed cover and lithographed label. While this may look like a fairly industrial object – which it should, as it mimics old soap packaging – each element of the book was handled countless times and shuttled back and forth between twelve different locations. All this without considering the soap element, 120 pounds of raw noodles, purchased in Tuscany and carried to Maine in my suitcases where I, together with my husband in my father’s barn during our “vacation”, formed the cubes by hand and embossed them with numbers. It may take years to turn a profit on this book (labor costs aside), but this way I can’t feel guilty about cashing in on someone else’s life story. And frankly, just bringing to completion a project of such proportion and personal importance – resolving the conceptual and physical dilemmas to my own satisfaction – is payment in itself. And it will be just as fun as the gum book for audience participation during lectures. Oddly enough, some of the sacrifice, anxiety and hardship I experienced during the project, as well as the need to economize because of errors in my own calculations regarding the amount of fabric and soap, related more to the protagonist in the story than I anticipated. Artists’ books are a way for me to orchestrate in what order information is revealed to the viewer – a sort of scavenger hunt in which the ideas are gradually revealed so that people can’t cheat and skip to the back of the book to find out the ending. But this time, the joke was on me. As I was focusing on the reader’s interaction with this edition, I ultimately underwent some unexpected things. Apart from doing a lot of domestic tasks for months on end – washing, sizing, and hanging up to dry, at one point I unwittingly involved myself in a mini-psychodrama. The situation mirrored that of the protagonist as I found myself hanging up the sized strips of linen, dripping with glue, on a laundry line, terrified the grumpy older woman in the adjacent building was going to come out and berate me. Those of you who have read the story will understand the irony. Soon afterward, a scarcity of materials forced me to learn the embroidery technique of hem-stitch from an elderly neighbor. (Although the woman who told me this story had tried and failed to teach me years before!) And of course the soap production itself was a throw-back to household tasks of yore. “But what about the lottery?” you are thinking. Well, on January 1st, 2000, at the house of the woman who told me the story, and also with her elderly mother, the daughter of Donna Teresa, I assigned all of you who purchased a copy a number with the disks of an Italian game of chance, Tombola, played especially at this time of year, and placed them in the Soap Story box. After shaking them up, the granddaughter extracted a number which had been assigned to the curator of printing and graphic arts at Harvard University’s Houghton Library. Anne Anninger, the curator, reacted with shock and joy over the phone from Calabria to Cambridge, but several weeks later, her sad voice on my phone machine announced that we needed to discuss things. As she was stepping down from her curator post in a few months, and couldn’t take the trip during her tenure, she felt it wasn’t appropriate to claim the prize. So you all (only thirty copies were sold in time) had yet another chance to win the trip to Italy. This time, a curator of special collections at Brown University’s John Hay Library won it during the second lottery conducted over the telephone between Bologna and Calabria. Most of you probably know I went to Brown, and through sheer serendipity the very same woman who won the lottery also happens to be the first person to ever buy my artists’ books. That came about thirteen years earlier, when the binder who worked in the basement where I held a student job suggested I take my undergraduate editions upstairs and show them to her. Which brings me to another aspect of the project, which might be titled “serendipity”, but which I prefer to describe with the term Konrad Oberhuber in Vienna taught me: “jokes of the angels”. First, I found it odd that the company in Tuscany from which I was going to buy the linen had the exact same name – Gori – as my soap manufacturer, based in another Tuscan city. So I looked it up in the dictionary. It originated as the Medieval Latin term for “canal”. Specifically, as the modern day spelling “gora”, it is defined as an artificial canal to irrigate land. The first page of Soap Story describes Donna Teresa’s artificial canal diverting water to her yard to create a private washing pool. The second definition given for “gora” is that of a basin or small pond in which linen is placed for rotting so that the fibers may be processed for weaving. How appropriate! The label depicts the plant known in Italian as “ginestra”, the flowers of which I associate with Calabria. In my mother’s garden, after the project was finished, I realized that in English, this plant is referred to as “broom” because it was and still is used to make the brooms of the type used by the people in the story. Only on January 1st did I discover that Donna Teresa was an expert weaver, and that the fibers of the plant Broom were often harvested and woven by her to make the cloth and rags stolen off the laundry-line by the young protagonist in order to diaper her child. Moments later, I was presented with a cloth made of broom fibers harvested by Donna Teresa herself that were woven years later by her daughter who was present by chance the day of the lottery. There is more to this tale, but enough is enough. I have given away much of the story already in order to explain the aftermath. But I refuse to “out” the text. So you will have to either visit a completed copy at a public institution somewhere, or use or your own, or perhaps buy another copy. Thank you for your support. It is always an honor when people purchase my work, and I truly appreciate it. Many of you were new collectors. I applaud your spirit of adventure in buying a work of art composed partially of such an unusual material as soap! Best wishes and thank you – and sorry it took so long to recapitulate. It’s hard enough to complete works much less write about them, document them and present them. I do my best. daring to wash without asking permission. The trespasser, shocked, ran off. women at the public washing area. first doctor moved there soon afterward. wash and cook for him. the wealthiest woman in town. who washed her sorrows away.